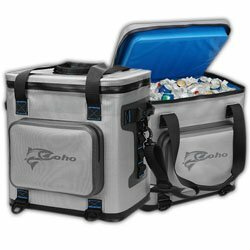 Coho Cooler Review - New Player, New Coolers. But are They Good? Thank for checking out bestcooler.reviews. Our Coho Cooler Review is another review looking at a newcomer trying to find a niche for themselves on the market. Coho Coolers is that newcomer. They are a brand new brand, and so they don’t have much in the way of reputation. That’s why we decided not to judge them based on the fact that they have just one cooler size and color available for both their hard and soft coolers. We understand that they are still testing the waters and trying to find a place for themselves in the market. We did, however, judge them on a few other things, which we will be glad to tell you about in this Coho cooler review. So buckle your safety belts, ladies and gentlemen; it’s going to be an insightful ride! To start with, we were glad that they made a rotomolded cooler. Rotomolded is the industry standard and any new player looking to properly penetrate the market and offer quality that is at par with what industry giants are doing is going to have to offer the highest quality ice chest, and that is a rotomolded one. 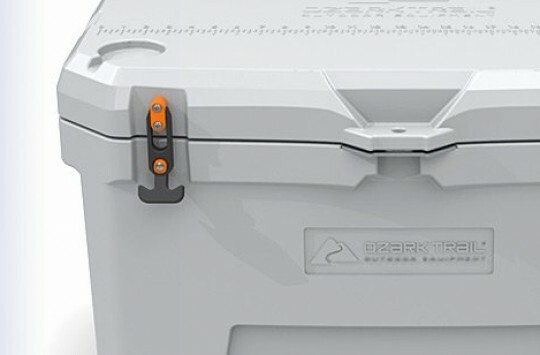 So, technology-wise, this is a solid cooler, and it is clear that it’s been built for the bold adventurer; the hunter, the fisherman, the camper, and the road trip junkie. The design is eerily similar to Yeti. This is where our problems begin. When we first saw this cooler, we couldn’t help but wonder whether Yeti had changed their logo and brand name because what we saw before us was a Yeti. I personally felt like repurposing Shakespeare’s old phrase: A rose by any other name… In this case, it would be a Yeti by any other name. 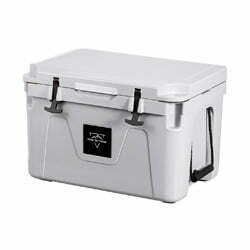 This cooler is while like a Yeti, sleek like a yeti, and has many of the design features Yeti is well known for. 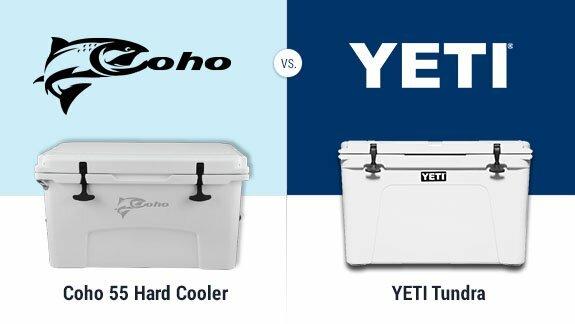 The only major difference between the Coho ice chest and the Yeti Tundra is that the Yeti Tundra does not have a 55-quart option and it does not have the Coho logo or name. 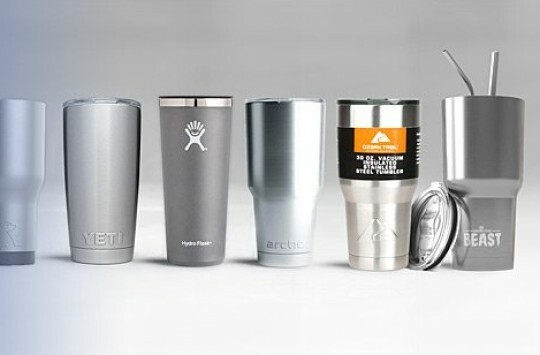 When it comes to the main design, the things you would expect from a Yeti are pretty much all here. The lid has a form-fitting design to ensure that it shuts tight and keeps the cold inside and the heat outside. The gasket inside is industrial grade to hug the lid even tighter and enhance the already strong insulation. The latches are rubber T-Latches for easy opening and hard closing, and also the peace of mind that you never have to deal with a busted latch. On the inside, we have the polyurethane foam insulation that keeps things super cold for days. Now, what we’ve come to expect of Yeti is that they take something generic, like insulation or rotomolded construction, and they give it a cool sounding name, which they trademark, of course. Coho Coolers do the exact same thing. Their cooler is rotomolded, but you won’t hear them say that. They call it PressMold. Their insulation is ExtremeCold insulation, and the walls on their ice chest are based on the ThickWall design. You start to see what they’re doing, and it all harkens back to Yeti’s branding techniques. We got so carried away talking about the construction and design that some of the discussion spilled over into features. Before we get too carried away, let us talk about some of those features here. To begin with, there are the latches on the lid and the gasket underneath it, both of which are pretty good by industry standards. There is also the bottle opener that comes with the lid, as a convenience so you don’t have to rack your head wondering how you’re going to open your beer. There is also a fish ruler on the lid of the cooler so that you can easily measure your catch. 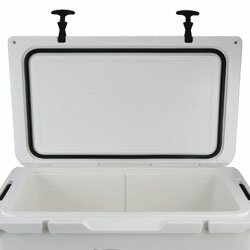 Because of the expected nature of the typical user of this cooler, it has lock ports on both ends so you can easily secure it to your vehicle or your boat when you know that you’re going to be doing some rough traveling. 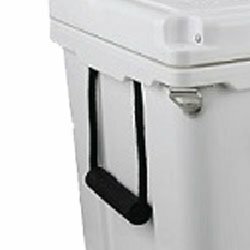 Because of the size of the cooler, another area you will probably want to put some thought into is the set of handles. 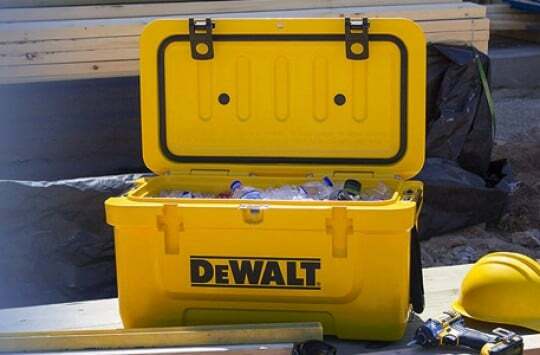 In this case, the cooler comes with some convenient handles in the side for easy hauling. The handles are made of strong nylon for durability, and they come with some pretty strong grip. Of course, Coho took the opportunity to trademark yet another name here and called them BigGrip handles. While we’re talking of big things, you will be happy to know that the grip on the feet of this cooler, trademarked BigFoot by Coho, is fantastic. If and when you’re on rough terrain, you don’t have to worry about your cooler sliding around. To be even safer you can use the lock ports to secure it even further using rope. The drainage system, trademarked Swirlout, is also pretty decent, ensuring you get to drain out your melted ice in record time. The insulation on this hard cooler is good, but not especially outstanding. Based on what we saw we didn’t expect that it would do much better than the industry standard, especially considering the design confined itself to the limits of what others were doing in the industry. We didn’t test the ice retention ourselves, but we did do our research based on users who have tried the cooler, and the consensus is that it will easily do about 4 or 5 days of ice retention. That’s pretty decent for this cooler. Just one size is available: the 55-quart cooler. It’s also only available in just one size: white. We sort of understood what Coho were going for here. Yeti has the Tundra 45 and the Tundra 65, which means there is a gap to be filled here and a market to be exploited, which would create a sweet spot for Coho to occupy. However, there are already many other brands occupying that sweet spot, like Lifetime and Otterbox, so Coho isn’t exactly unique. Also, we have gotten so numbed by seeing others copy Yeti that at this point any form of innovation and originality is welcome. We didn’t see much of either here. Seeing as this is still a new brand, there are a lot of things we still don’t know much about. We don’t know of any warranty on the cooler yet. We also don’t know where the cooler is manufactured, so we would like to assume they are designed in the USA and manufactured overseas since that’s how many newcomers do it these days. 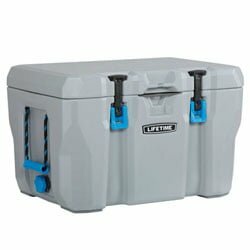 As for the price, it is certainly cheaper than a Yeti Tundra, but it isn’t exactly the cheapest cooler in its class. The Otterbox is roughly the same price and the Lifetime is almost half the price. This part felt a little like the Twilight Zone for us. We felt like we were comparing Yeti to itself, and not in a good way. On the one hand, we have the original Yeti we know, and on the other, we have a discount Yeti lookalike that tries hard to measure up. To begin with, Yeti beats Coho when it comes to variety. Coho has just one size and color available while Yeti has a whole range of available colors, sizes, and accessories. The Yeti Tundra also has an edge when it comes to ice retention, being able to retain ice for longer than the Coho. The design of the Coho is similar to that of the Yeti. To be sure, we get it: they wanted to exploit an all-too-common niche in the coolers market where buyers are looking for knockoff Yetis that are affordable and even almost half as good at performance. However, this niche is starting to get crowded in our opinion, and it signals a lack of innovation in the market, which is not good news. 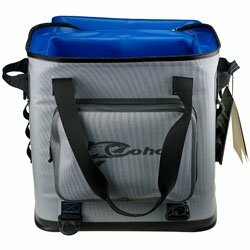 There really isn’t anything wrong with the design of the Coho cooler; it is sleek and beautiful. However, we’ve seen too many coolers that look like the Yeti, and we wouldn’t mind seeing some refreshing innovations, no matter how small. As far as price is concerned, the Coho is slightly cheaper than the Yeti Tundra, but not by much. 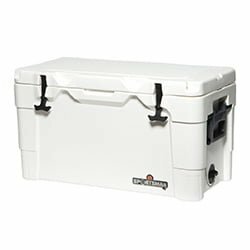 You would get a much better bargain getting the 55-quart Lifetime cooler. If you’re a Yeti fan and want to either join or remain a part of the Yeti bandwagon, then we suggest you buy the Yeti Roadie. You also should have the pockets to match the price tag on this premium cooler. However, if your budget is more modest and you don’t mind trying a different brand, all of the cooler brands above make for great alternatives to the Roadie. The most interesting thing about the Igloo Sportsman, which we have reviewed before, is that it also offers a 55-quart option. It also happens to be slightly cheaper than the Coho, so it’s worth checking out. It has more variety than the Coho but has a design fairly similar to the Yeti’s, just like the Coho. Pure Outdoor, which we’ve reviewed before, does not have a 55-quart cooler. However, it has a 50-quart cooler, which is pretty close. 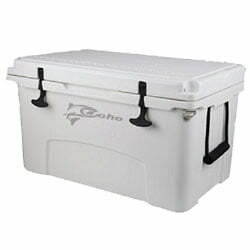 This cooler is similar in design to the Yeti, just like the Coho, but has lots more color option than the Coho. Also, Pure Outdoor has more size variety. They also happen to be cheaper. 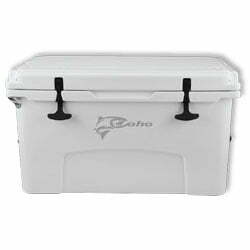 Lifetime Coolers have a 55-quart option like the Coho and also happen to be a fairly well-established brand. Their coolers have more variety in terms of colors and sizes than the Coho, and the 55-quart option happens to be cheaper than the Coho. We also love the blue accents on their white cooler. And they’re not just another Yeti lookalike either. We decided to make this part of the review fairly short because, quite honestly, it felt like de Ja Vu for us. To begin with, the RealCold soft cooler looks eerily like the RTIC SoftPak and the Yeti Hopper Flip. This isn’t the first time we’re seeing a soft cooler that seems to be a direct rip-off of these two. We’ve seen it before with the Homitt and the Patriot Soft Pack, so it felt like it didn’t warrant a full review. In terms of design and construction, the RealCold soft cooler is pretty much a decent soft cooler. It has a lunch box design, cold cell foam insulation, a welded liner, a strong zipper, and a well thought out lid that maximizes on space. It also has extra pockets for accessories on the front and back as well as side handles for easy carrying and a shoulder strap for those who would rather do their carrying hands-free. The ice retention is satisfactory, lasting between 24 and 36 hours as you would expect from a good soft cooler. We really don’t have any qualms with the design and construction, or the performance, for that matter. The problem is that we’re seeing something we have already seen before more times than we care to remember and it gets a little mind-numbing when the industry sees such a dearth of innovation. But hey, that’s just for us cooler geeks! For the average Joe, this is, of course, a great piece of equipment. And we really do like the very large cargo pocket in the front! Seeing as it’s a new brand, we are yet to see them on Amazon. They do have their own store on their website, where you can buy the coolers, and we have spotted some of them in a few Costco stores. However, it wouldn’t hurt to try and search for them on Amazon. If they’re not available there, then the next best place to buy them online is on their website. To end out Coho Cooler Review, we would like to point out our mixed feelings about the cooler. On the one hand, we’re pretty excited to see a new player on the market. On the other hand, we are a bit disappointed that they’re not bringing anything new to the table just yet. Hopefully, with time, they’ll have a little more innovation to offer.